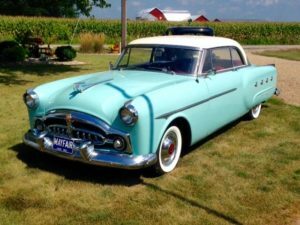 She’s a comfortable and reliable touring Packard with 72K miles, good working Ultramatic, correct Light Blue Turquoise respray, otherwise ALL ORIGINAL! Perfect red leather/cloth, smooth and shiny chrome. optional chrome fins, “shielded” bezels, skirts, cloisonné covers. Brand new WWR’s. NADA says she’s worth $15K-$21K. It’s a beautiful, rather rare original Packard ready to show or tour. We are downsizing the herd. We live in rural NW Ohio near Defiance.